Becky & Tom chose Morden Hall as their place to marry. Located in South London, this exclusive wedding venue is located in 125 acres of gorgeous National Trust greenery. The Manor house itself is exquisite and is decorated and furnished perfectly for a modern yet classic wedding day. On the morning of the Wedding we met Becky and her Bridesmaids at Morden Hall after they had already had their hair and make up completed. With the dresses, flowers and accessories waiting for them at the venue – this was a fantastic idea. When the girls arrived, we had already photographed all the bits we needed to. 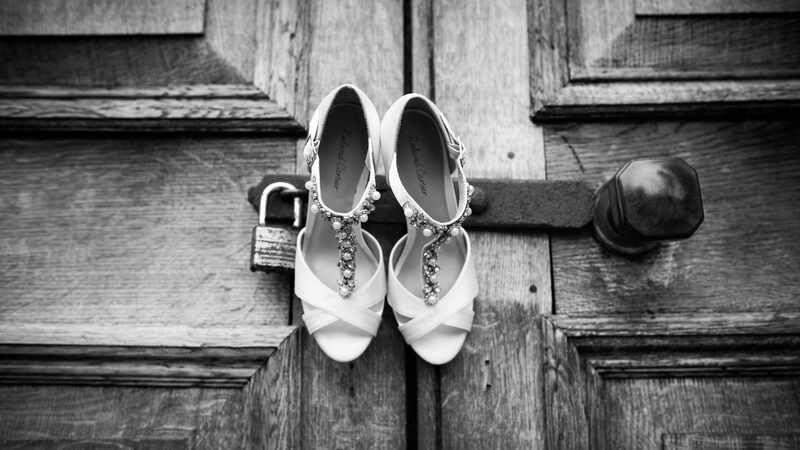 All they had to do was step into their dresses, pop their shoes on and head down for the I do’s! A perfect idea to cut out the stress of travelling in their dresses! With the stunning Bride ready to meet Tom at the end of the aisle, the girls headed down the cascading staircase into the room full of eagerly awaiting guests! The room was wowed as Becky headed to marry her fiancé. The ceremony was wonderful and the Bride & Grooms faces were beaming for the duration. Afterwards, the guests headed out for drinks on the terrace. The weather was perfect with gorgeous blue skies and fluffy white clouds. After plenty of photos, everyone headed in for a meal and speeches. The room was decorated wonderfully with tables oozing with sophistication. Rose gold bottles were filled with a lovely mixture of neutral green and white floral displays. Everything had come together perfectly. The speeches contained a brilliant balance of humour and emotion and had the guests laughing and crying! Tom & Becky’s evening celebrations were full of fun, laughter and plenty of dancing! An absolutely perfect day for a couple who were such a pleasure to work with. We thoroughly enjoyed this wedding and it was wonderful catching up with two other couples whose weddings we also photographed. Enjoy this? Take a look at Sian & Stephen’s big day..